Click the button below to add the George Knight DK3 Mug Heat Press to your wish list. As with all Digital Knight presses, the DK3 utilizes a state-of-the-art digital control system. With digital temperature, time and programmable presets, cycle counter and many other features, the consistency, and productivity of mug printing are maximized. 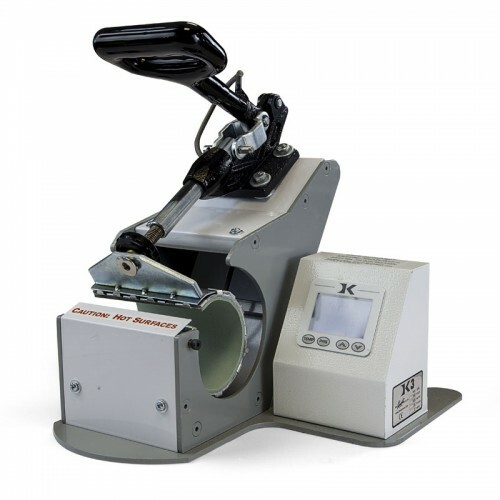 At the heart of the DK3 is the SuperCoil-Microwinding™ heater technology, a system of embedded heater windings that wind tightly and closely together throughout the entire platen for extremely even heat, fast recovery & fast heat up times. The DK3 will start up in only a few minutes, and unlike other presses runs constantly at the set temperature, instead of a much lower idle temperature. Unlike other mug presses that use silicone blankets with short lifespans. The patented stainless steel mug band heater technology Geo Knight is famous for has proven to be far more reliable in the field than traditional methods.